Joique Dewayne Bell Jr. (born August 4, 1986) is an American football running back who is currently a free agent. He played college football at Wayne State. Bell was signed by the Buffalo Bills as an undrafted free agent in 2010. He has also been a member of the Philadelphia Eagles, Indianapolis Colts, New Orleans Saints, Detroit Lions and Chicago Bears. As a senior, Bell was the winner of the Harlon Hill Trophy, awarded to the Division II player of the year, after he rushed for 2,084 yards and 29 touchdowns. After going undrafted in the 2010 NFL Draft, Bell signed with the Buffalo Bills on April 29, 2010. On September 4, 2010, he was released by the Bills during final team cuts. Bell was signed to the Bills' practice squad the following day. On September 21, 2010, the Philadelphia Eagles' signed Bell off the Bills' practice squad. He was released by the Eagles on November 10, 2010. Bell was claimed off waivers by the Indianapolis Colts on November 11, 2010. On December 15, 2010, Bell was released by the Colts. On December 16, 2010, Bell was signed to the Eagles' practice squad. Bell was signed off the Eagles' practice squad by the New Orleans Saints on January 5, 2011 before the playoffs began. He was released on September 20, 2011, and re-signed to the Saints' practice squad the following day. On December 26, 2011, Bell was signed by the Detroit Lions. He played his first game with the Lions on September 9, 2012, and appeared in all 16 games of the 2012 season, compiling 414 rushing yards on 82 carries (5.0 average) with three rushing touchdowns. He also hauled in 52 receptions for 485 yards; 28 of his receptions were for first downs. He was re-signed by the Lions in April, 2013. He again played all 16 games for Detroit, finishing with 650 rushing yards and eight rushing touchdowns. Bell also caught 53 passes for 547 yards, as he and teammate Reggie Bush (54 receptions, 506 yards) became the first running back tandem in NFL history to both top 500 rushing yards and 500 receiving yards in a season. On March 11, 2014, he signed a two-year, $7 million contract extension with $4.3 million in guaranteed money. Combined with the second round tender he signed worth $2.187 million, he is under contract for three years and $9.3 million overall. On February 16, 2016, Bell was released by the Detroit Lions. On September 27, 2016, Bell was signed by the Chicago Bears. On October 24, he was released by the Bears. Bell was born in Benton Harbor, Michigan and majored in criminal justice at Wayne State. While a student at Wayne State, Bell worked as a security guard at the Detroit Lions' training camp. ↑ "Wayne St. RB Joique Bell named Division II player of the year". ESPN.com. Retrieved 14 September 2015. ↑ Brown, Chris (April 29, 2010). "Local WR Roosevelt headlines latest undrafted signings". BuffaloBills.com. Retrieved November 8, 2016. ↑ "Bills release 19 players". BuffaloBills.com. September 4, 2010. Retrieved November 8, 2016. ↑ Brown, Chris (September 5, 2010). "Bills sign TE Martin, G Urbik". BuffaloBills.com. Retrieved November 8, 2016. ↑ Wulf, Bo (September 21, 2010). "Eagles sign RB Bell; release WR Baskett". PhiladelphiaEagles.com. Retrieved November 8, 2016. ↑ Wulf, Bo (November 10, 2010). "Eagles sign S Colt Anderson; release RB Bell". PhiladelphiaEagles.com. Retrieved November 8, 2016. ↑ McPherson, Chris (December 16, 2010). "Eagles bring back RB Joique Bell". PhiladelphiaEagles.com. Retrieved November 8, 2016. ↑ "Twitter". twitter.com. Retrieved 14 September 2015. ↑ "Joique Bell". ESPN.com. Retrieved 14 September 2015. ↑ Joique Bell player page at cbssports.com cbssports.com, retrieved 19 November 2013. ↑ "Lions re-sign RB Joique Bell". Associated Press. April 15, 2013. Retrieved April 15, 2013. 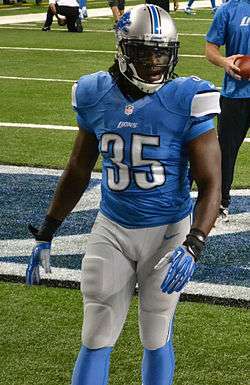 ↑ "Joique Bell signs 2-year extension with Detroit Lions". NFL.com. Retrieved 14 September 2015. ↑ "Lions tender running back Joique Bell, later receives 3-year, $9.3 million extension.". Yahoo Sports. 11 March 2014. Retrieved 14 September 2015. ↑ O'Hara, Mike (February 16, 2016). "Lions part ways with Joique Bell". NFL.com. Retrieved February 16, 2016. ↑ Mayer, Larry. "Bears ink Joique Bell, put Fuller on IR". ChicagoBears.com. Retrieved September 27, 2016. ↑ Bouda, Nate (October 24, 2016). "Bears Release Veteran RB Joique Bell". NFL Trade Rumors. Retrieved October 24, 2016. ↑ Simons, Marshal. Detroit Lions' and former WSU RB Joique Bell sits down with The South End. The South End. 7 November 2014. Retrieved 3 January 2015. ↑ Litman, Laken. Detroit Lions running back goes from team security guard to active roster. usatoday.com. 18 December 2013. Retrieved 3 January 2015.